I am writing to say yes, it is possible to re-organize, rejuvenate and “remodel” facial skin, fascia, muscles and bones. It does take work and it is necessary to develop new habits. Using easy, simple practices, you can develop an evolving skin care routine to improve skin conditions. 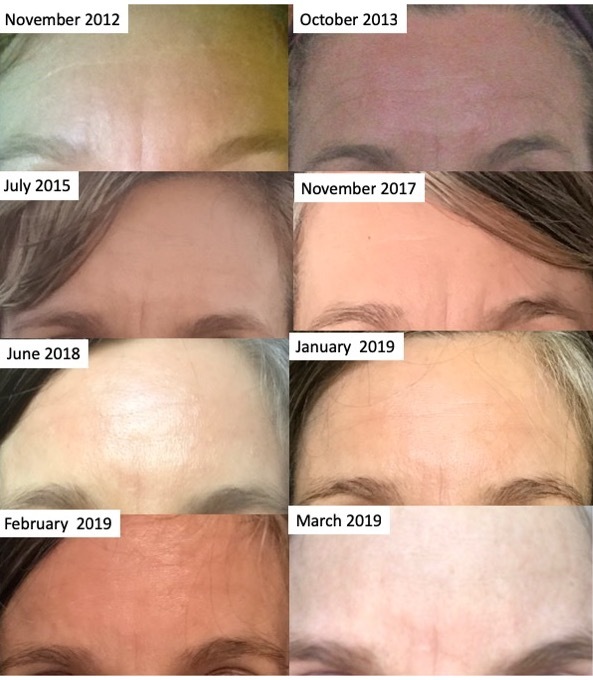 I began using forehead rejuvenation techniques in about January 2018. These photos show forehead conditions pre- and post-forehead rejuvenation practices. While using skin care tools I realized that facial lines are more than skin deep and that the tissue below the skin is scarred . I noticed that the tools would sort of get caught in the indentations in the fascia and muscle beneath the lines in the skin. At that time, I began a routine to smooth my forehead using a multifaceted approach. I continue to use these practices and feel that they have resulted in larger benefits as a result of reducing muscle tension and smoothing the fascia. I’ve used the following techniques to smooth forehead skin, fascia and muscles as described in detail in the May 2018 article. · Index Knobber II – as I’ve trained myself to relax my facial muscles, I’ve used this tool less over time because my forehead muscles have become smoother. · Gua Sha – this tool may be used to loosen fascia and increase circulation. It is a must have to smooth soft tissue and help relieve pain everywhere on the body. · FaceBlaster – this is a terrific tool for releasing fascia tension and tightness and provides a great massage. This tool helps to “feel” conditions beneath the skin. · Sanford Bennett’s wrinkle rubout – this effective practice is great for releasing tension and remodeling the fascia. The method is easy and costs nothing but a little bit of time. · Facial trigger point therapy – this is key to releasing forehead tension. Lay on the floor and press the face into a small stiff yoga ball to find sore spots and to release tension. · Facial Pads – I’ve been using Frownies but am looking for a less costly alternative. Use facial pads nightly during sleep to prohibit the muscle from contracting and to retrain the forehead muscles to remain in a relaxed state. · Tripolar STOP radiofrequency device – I’ve used this less over time, mostly due to lack of time. · Derminator mechanical microneedling device – for me, this is the best tool to remodel and rejuvenate the skin. The single needle cartridge is used within facial lines to promote collagen production to fill the line in. · Facial Massage – this is an easy practice to increase blood and lymph circulation and to release muscle tension and to promote smooth muscles. · Flex Effect –resistance facial exercises increase circulation 10 times bringing oxygen and nutrients into facial muscles and skin. The program also includes bone rejuvenation techniques to reduce bone loss and friction massage techniques to remodel the skin. This is a powerful practice. · Vitamins A and C – topical application of these active ingredients support collagen production and are most effective when used every day as Retin-A or retinol at night and vitamin C serum every morning. These nutrients support collagen production and are basic requirements for skin rejuvenation. · Aloe Vera – I always grow a crowded pot of Aloe Vera plants, they naturally grow in tight clumps. I cut off a leaf at the base and keep it in the bathroom wrapped in parchment paper. I cut off a two inch piece, open it up and smear the gel over my eyes and entire face and neck. After it dries I either apply a handcrafted cream or an oil such as raw organic Avocado Oil. Aloe Vera gel is healing and promotes collagen and elastin production. I use it for all skin ailments and rely on it as a beauty product. You may find fresh Aloe Vera leaves in the produce section of your local grocery store. I prefer to use it fresh, otherwise preservatives are required. · Silicone mask – I recently purchased a silicone face mask. After applying a facial mask of your choice (I apply fresh Aloe Vera Gel) place the mask over it to keep the Aloe Vera and skin moist. Facial fascia and muscle relaxation techniques are effective at reducing tension. Notice whether your facial muscles tighten when thinking. If so, release the tension in the muscles and notice what your facial tension habits are. Once you become aware of facial tension you can break the pattern and make new habits to promote a serene forehead. Of course, I still raise my eyebrows and furrow my brow when I talk and think, but I’ve learned to catch myself and relax my forehead diminishing the appearance of ingrained lines. The best thing is that I began to notice how often I hold my face muscles and all the muscles of my body in tension. As a result of my forehead smoothing practice, I’ve learned to notice and release tension throughout my body. This has greatly improved the quality of my life. Who knew! The prices for the posted products are the same as you would pay if you had found the link yourself, however, as an Amazon Associate I earn a small fee from qualifying purchases which goes towards helping maintain this site. Thank you!